Our group is very interested in studying the basic mechanisms of transport across biological membranes. As engineers we use these fundamental studies to guide the development of more practical approaches to developing stable synthetic materials that can mimic the properties of these molecules. The two classes of membrane proteins we are currently evaluating include water channels and Rhodopsins. has the highest reported water transport rate of any aquaporin. We are currently evaluating whether this is due to its intrinsically high permeability or its better insertion into the lipid and block copolymer systems we use. measuring accurate per molecule transport rates for rhodopsins under various illumination conditions (see Figure). We are currently working on the chloride pump from Natromonas pharaonis isolated from highly saline lakes and the only sodium and lithium pump known – KR2 from the marine flavobacterium Krokinobacter eikastus. A surprising and totally science fiction type application of these pumps is in the field of optogenetics where parts of mammalian brains can be excited or “turned off”! In these applications these proteins are first expressed in neurons of mammals and then the neurons can either be hyperpolarized or silences by creating or abolishing ionic gradients across membranes by the use of light. Transport through membrane protein transporters. Designing and testing membrane protein mimetic synthetic molecules. include the pillararene channels developed by our collaborators in Fudan University, China (Jun Li Hou group) and the ureido‐imadazole channel developed by the Barboiu group at CNRS, Montpellier, France. We collaborate with the Alek Aksimentiev group to conduct simulations on pillararene channels. While we work on developing analogs of intricate membrane proteins, we have chosen a few membrane proteins with a stable structure for integrating into engineering applications. We hope these devices can be stable for applications but more importantly it will provide us about clues and ideas on how to stabilize such biotic‐abiotic systems that could help us tap natural systems in unique ways. Porin crystals as membrane filtration materials. We work with two porins – one with ~1 nm size pores (OmpF) and another with a pore size of ~2.8 Å (AQPs). We crystallize these proteins into lipids and block copolymers in flat two dimensional arrays. 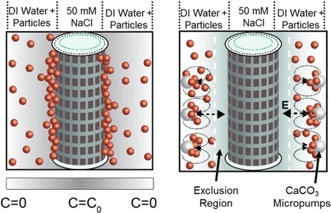 These arrays are then immobilized on porous substrates to make highlyfunctional filtration membranes ‐ the larger pore size protein crystals for removing solutes larger than ~ 500 Da and the small pore size protein crystals for removing all solutes (including salts) from water. We conduct fundamental research on synthetic, biological and biomimetic membranes. The research is performed with the goal of developing stable, high performance membranes for energy and applications. We are also exploring biomedical and consumer applications for these materials. We study the structure and function of cell membrane protein transporters that perform a majority of the transport across cell membranes with exceptional efficiency and selectivity and then try to recapitulate the same function in synthetic materials. We use stable block copolymers as analogs of biological lipids and channel forming cyclic molecules to form synthetic “transporters”. Applications of the work include for separations, sensors, responsive fabrics and biomedical applications. P.I. Kumar brings his industrial experience in membranes (~7 years) to research membrane biofouling and colloidal fouling as well. Photosynthetic protein crystals for solar photoconversion. We are working on a photoconversion device based on the photosynthetic protein, Photosystem I, found in cyanobacteria. We recently packed a large amount of this protein into a lipid membrane leading to the formation of a flat two-dimensional crystal. This crystal was then wired to an electrode though a conductive bilayer that helps promote protein stability while allowing shuttling of electrons between the electrode and the protein crystals. 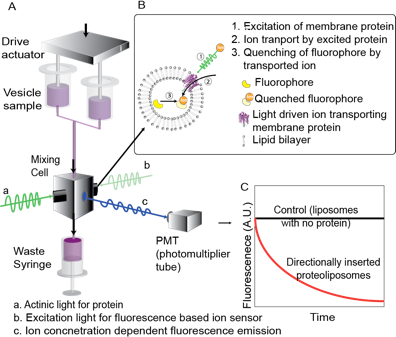 We reported the highest photocurrent reported per protein used compared to other similar devices. Saboe, Patrick O., et al. "Two‐Dimensional Protein Crystals for Solar Energy Conversion." Advanced Materials 26.41 (2014): 7064-7069. Colloidal fouling through Diffusiophoresis. The group has recently discovered (in collaboration with the Darrell Velegol group, Penn State) that salt gradients next to membranes such as the RO membrane can cause substantial increase in colloidal deposition on RO membranes using a mechanism not previously described in literature. We are now working to reverse this phenomenon known as “diffusiophoresis” to disrupt colloidal fouling on RO membranes. Kar, Abhishek, et al. 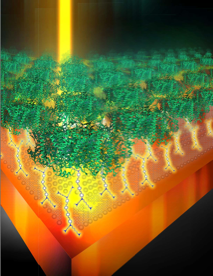 "Particle Deposition on Microporous Membranes Can Be Enhanced or Reduced by Salt Gradients." Langmuir 30.3 (2014): 793-799. Mitigating biofouling by using engineered biofilms. Bacteria like to live in communities known as biofilms on hydrated surfaces including water treatment membranes. Almost no technology works perfectly to combat biofouling on RO membranes. We are using the approach of “fight fire with fire” to develop a novel beneficial biofilm forming bacteria that can control its own thickness to prevent performance deterioration in RO systems while repelling all other bacterial species through quorum sensing. This work is being conducted in collaboration with the Thomas Wood group at Penn State. Synthetic membranes for desalination‐ colloidal and biological fouling mitigation.